The advanced Firewall includes application filtering and blocks unauthorized attempts when other devices attempt to connect to your home network. The vulnerability scanner on BullGuard is very efficient. It wards off hackers by notifying you as soon as a security update is missed as well as avoids connections to unsecure WiFi networks. The vulnerability scanner was also recently revamped to be useful for the latest version of the Windows operating system. Are you a serious gamer? BullGuard features patented Game Booster technology. It is built to deliver high PC performance by blocking annoying ads and other obstructions that contribute to game lag. Basic parental controls provide parents with the ability to block access to suspicious websites, implement search filters, limit screen time, monitor online activity and even block certain applications entirely. BullGuard supports Windows XP, Windows Vista and Windows 7, 8 and 10 operating systems. It is required that users have at least 600 MB of free space on the hard drive. Additionally, 1 GB of RAM and Internet Explorer 6 or higher is necessary. BullGuard features a straightforward, and relatively easy to understand install process. The time spent installing the antivirus software is not too long so you can get it up and running in little time. Comprehensive instructions are also available online through BullGuard’s website, though the step by step windows on the install manager should explain everything. Performance using a PC while also running a security check or scan is standard. A little lag may exist when you are using a lot of bandwidth on say, watching a video, but for the most part speed and performance of the PC is not bogged down when using the computer at the same time it scans. BullGuard presents three different security packages for home or small office antivirus software. BullGuard Antivirus is their basic product, and provides traditional defense and coverage with very few extras. It retails at $30 per year for one PC. Unlike the other two plans, there is no ability to license the antivirus for more than one user. 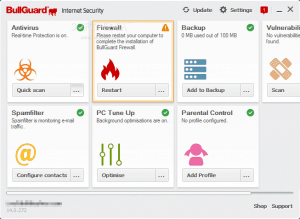 The BullGuard Internet Security software retails at $60 per year and includes licensing for multiple devices. It is much more comprehensive than the basic software, not to mention the ability to install it on several different devices. The Premium Protection suite, meanwhile, retails at $100 per year and also features multiple devices. BullGuard provides 24/7 live chat for its customers and email support. They also have several useful resources, including a detailed FAQ list and more hands-on approaches. Response times are quick and BullGuard reps seem very knowledgeable. BullGuard is modestly priced which makes it attractive to some of the more expensive antivirus software programs such as Norton and VIPRE. While it does feature a well rounded list of security tools and measures, mixed performance in some independent studies leads us to believe that BullGuard is good, but not the best antivirus software on the market.